Where to find the best car body shop near me with no wait? 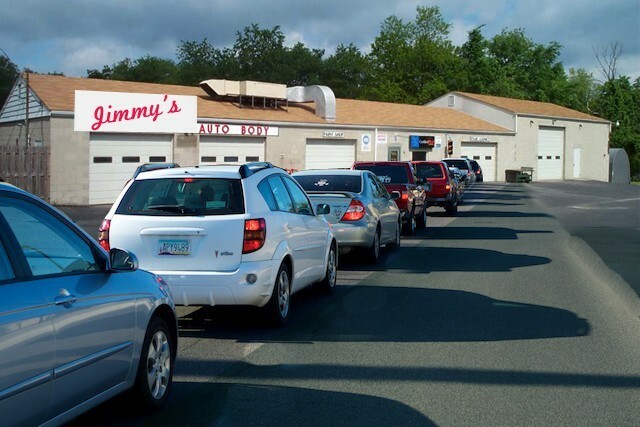 If you are reading this and are located anywhere on the east coast from Alabama up to New England, you are most likely experiencing ridiculous wait times to get your car fixed at an auto body repair shop. The reason for this is obvious; the winter of 2014 has been an all out record breaker, and has caused so many car accidents in areas that just don’t get that much winter snow, sleet or ice. As I write this post, there is 12” or more of snow on the ground with another storm coming tonight, tomorrow and Tuesday. Most businesses and auto body repair shops near me are closed today, and the unusually high volume of repairs coupled with body shops having to close because of the weather, coupled with delayed parts deliveries have almost all body shops around experiencing two to three month wait times before they can even begin working on your car. This is not just a winter 2014 problem either. Some states where hail damage is a frequent occurrence often experience massive backlogs of work when a storm blows in and damages cars by the thousands. So what do you do if the auto body shop that your insurance company just recommended can’t take your car in for several months? Allow me to give you a few suggestions. Call your local shop anyway and get an estimate. Auto body shops try as best as they can to schedule repairs so that they move quickly through their shop, and they take on jobs in the order that they came in as one might expect. In the case of the backlogs however, shops will get very strategic in how they assign work and will schedule jobs in the order that keeps the wheels turning in the shop. So perhaps they just received a lot of really heavily damaged cars just ahead of you. Your simple bumper and fender job might be just the job they need right now to keep the workload moving so that the bigger jobs don’t bring the workflow to a standstill. Don’t just take your insurance company adjusters word that the shop you want to use is booked. When you bring your car in for an estimate, you can begin the dialogue with that shop and see if there is a way to squeeze your job in sooner. Look for a body shop with multiple locations in one area. Sure the facility right down the street might be the most convenient one to you, but if a shop has multiple locations within a major city, it is not uncommon for them to shuttle cars back and fourth between locations in what the auto body shops call “load balancing”. Many times you can deal with the office near you, while the car is being repaired at one of the other facilities. When the car is finished, they will flat bed it back to the location you are working with. A shop with multiple locations might be able to fit your repair in faster when they load balance their weekly or monthly workload. A body shop with multiple locations is called an “MSO” meaning multi shop operation. When doing your search for auto body shops with multiple locations, look for MSO’s. Look for a shop with free pick up and delivery. As you look around for alternate shops, consider one that will offer to pick your car or truck up where you are and deliver it to where you are. If they have a availability, and are a good shop to work with, what does it matter if the shop is a little further out of the way? Look for a shop with multiple paint booths. Paint booths are major capital investment for body shops, and they take up a lot of space. However the paint booth is the heartbeat of any autobody shop. The paint booth is the one piece of equipment that actually sets the pace for when jobs get completed because while a shop can work on several cars at the same time, the paint booth only allows for one paint job at a time. Body shops with multiple booths simply move cars through faster. If your favorite shop can’t get to your car, I would start looking around for MSO’s and ones with multiple booths. By fingers I mean the Internet. Use a service like ours here at AutoBody-Review.com to find shops in your area, or just outside your area. In just a couple of clicks you can search through reviews, check out photos, and even contact the shop directly without ever having to leave the site. Now how is that for convenience?! Shelly was very professional and kept me informed as to the progress. I will recommend Mike **** in the future.